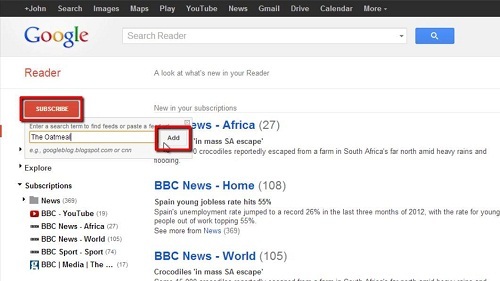 Learning how to add google reader folder is a touch complicated, this tutorial will show you how to do it. 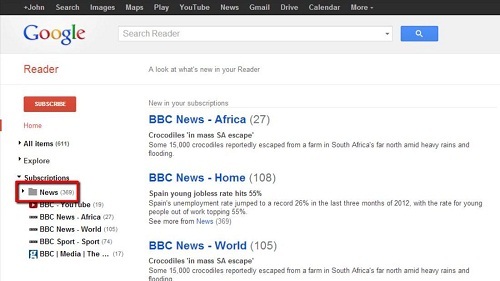 Navigate to Google Reader. In the bar on the left hand side you will all the current folders, in this example we have one called “News”. We are going to want to create another folder like this for a different subject. First, you actually need to subscribe to something you would want in that folder. Let’s assume we are making a comedy folder, so we will click on “Subscribe” and search for something funny, such as “The Oatmeal”, click “Add”. In the search results to the right, find the feed you want, in this case the top result, and click “Subscribe”. A yellow box will appear in the top of the screen stating that you have been subscribed successfully. You can now see a new subscription has been added to the “News” folder called “Comic, Quizzes…” etc. Hover your cursor over this and click on the arrow that appears to the right. In the menu that appears click the “New folder” button and in the dialog box give a name for the folder, in this case “Comedy”. 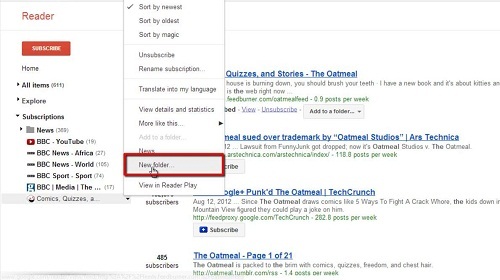 Click “OK” and you will see a new folder with the subscription in it appear on the left and that is how to add google reader folder.